Yes, I am back! The last time I sat and wrote an article was long before I left for Thailand (I had a wonderful time, thanks for asking) and since then we’ve had a lovely new addition to the world in the form of Prince George. With the arrival of Prince George, I began to think of how, as a new mother, Kate won’t have as much time to herself any more, especially in terms of rest, relaxation, and pampering, and in our lives, we often don’t find any me-time in the day either so what can we do to rectify this and make sure our pampering-needs don’t leave us? 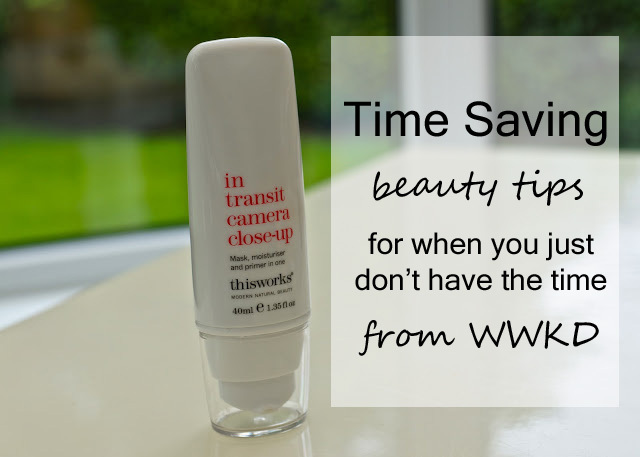 This Works In Transit Camera Close Up is a mask, moisturiser, and primer, all in one so it’s perfect if you don’t have time to apply a million different creams in the morning. It’s also great if you’re travelling by air and are stuck for space in your bag! It brightens and smooths the skin, erases the signs of fatigue, and is a perfect base for make up. A while ago, the WWKD team were sent some samples of Heaven’s Bee Venom Face Mask to try out, which is a particular favourite of both the Duchess of Cambridge and the Duchess of Cornwall. Aside from lasting me what feels like months, I’ve found that this works amazingly as not just a mask but as a moisturiser as well so putting this on after cleansing means will give you all the moisture benefits while giving you all the mask properties as well, and you don’t need to wash it off. I also used this while abroad and discovered that it’s perfect for calming down any irritations and sensitivity caused by different weather and new environments. Moving onto make up, many of us find ourselves having to rush through painting our faces in the morning, and when you have a little baby like Kate does now, you may find that you have even less time! Some amazing products are around though like MAC’s Studio Tech which is a foundation and powder in one so you can just brush this over and be done with your base in no time at all. If you find yourself lacking time for skincare, then try Laura Mercier Tinted Moisturiser which moisturises the skin and gives you a hint of colour and coverage to eradicate the need for a heavier foundation. A new product to hit the shelves more recently is the Nivea In Shower Body Moisturiser so you can moisturise while in the shower, rinse, and never have to wait half an hour for it to sink in ever again! A must on every woman’s beauty shelf (I have a beauty draw but we’ll carry on) is dry shampoo! If you haven’t got yourself any then pop out and get some! Washing your hair every day isn’t good and if you’re trying to get out of the habit of that, then dry shampoo is the perfect way to help on that second day. But using something like Batiste is also great if you can’t find the time to wash it and need to quickly give your hair a boost in the morning! Whatever products we use to help us save time, it’s important that we do find a moment once a week to take an hour out for ourselves – a bubble bath, candles, a face mask, and a book, and we can all feel and look great like Kate.